Today, a friend and I decided to venture out and do a little bit of Urban Exploration. It’s been a long while since we visited Camelot Theme Park in Chorley, and I’ve always wanted to go and do some more, so when I found a friend who also liked the idea, we decided to give it a go. Our first location of the day was actually Barnes Hospital in Cheadle, but unfortunately, work has now commenced on the new housing complex, and the site was swarming with builders. We did spot a possible entrance though, so may look at revisiting outside working hours on another day. 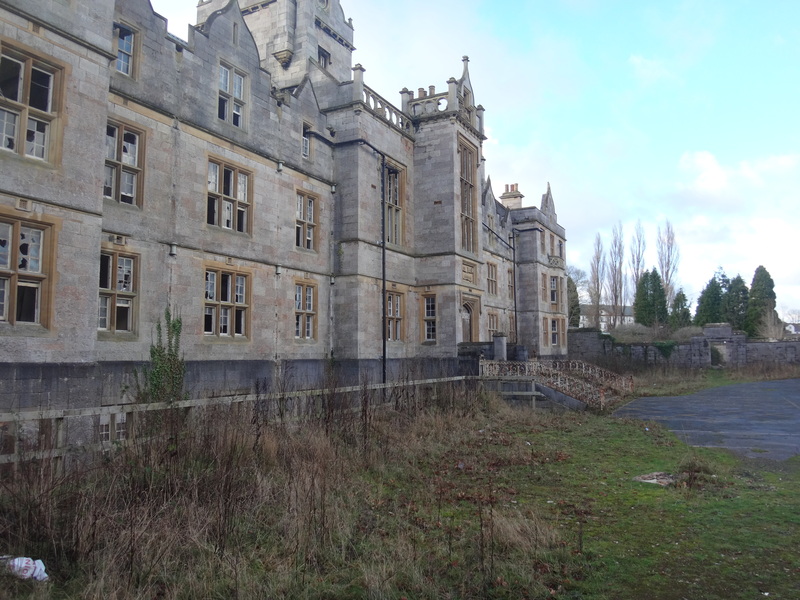 After our failure at Barnes Hospital, we decided to head out to North Wales and give Denbigh Asylum a try. The North Wales Hospital (locally known as Denbigh Mental or Denbigh Asylum) is a Grade II listed building. Designed by architect Thomas Fulljames, building started in 1844 and completed in 1848. Once a hospital for people with psychiatric illnesses, at its maximum capacity it could house 200 patients. It is located in Denbigh, Denbighshire, Wales. Once we arrived, access to the site itself was pretty straight forward, and we headed straight towards what we think was the Nurses Home. Our first location, along with the rest of the site was already pretty trashed, but on the whole, this building was in reasonable condition, and we were able to explore all three floors. After the Nurses Home, we headed towards the main complex and up to the Chapel and mortuary, which again, had been pretty trashed by previous visitors. After that we made our way towards the main block of buildings. It was during this time that we found ourselves pretty turned around in the endless adjoining rooms. Although we eventually managed to visit all of the buildings (we think) as we made our way through, we did come across numerous access issues. The buildings were obviously badly affected by the recent heavy rain, with many lower rooms being flooded or water logged. We also found that the further towards the main entrance we got, the more building damage we found. The upper floors were often completely missing, ground floors were riddled with holes, and we even found ourselves navigating collapsed ceilings. The highlight of our trip had to be coming upon a corridor with part of the floor missing, and only the wooden beams remaining across the gap. Of course, just as I was about to get all the way across, the beam I was balancing on broke, and I started to fall to my doom! In reality of course, the hole beneath me was not that deep, and in any case I managed to reach and grab the other side, pulling myself to safety with a few minor scrapes and bruises. I do have to say though that it was lesson learned for me, and I shall no longer be walking across wet wooden beams in abandoned places…..
What an adventure! I’ve never heard of Urban Exploration – looks like fun. You got some great photos! I imagine some awful things happened to mentally ill people there. So glad places like this are out of service. Oh wow, you are so brave (and a little bit crazy). This is the stuff of tv programmes when you just know a disaster is approaching and Charlie Fairhead is on his way!